ICAST 2018! Best Show Yet! Its our 4th consecutive year displaying at a booth at the worlds largest Sport Fishing Trade Show! Held each year in either Orlando FL or Las Vegas NV the ICAST show draws dealers and Industry professional from around the globe to see the newest and hottest products and companies in the fishing and boating industry. It was a fantastic show and we got to meet a lot of famous anglers such as Wicked Tuna Champion Tyler Mclaughlin! 6/25/2018 New Brick and Mortar Dealer! 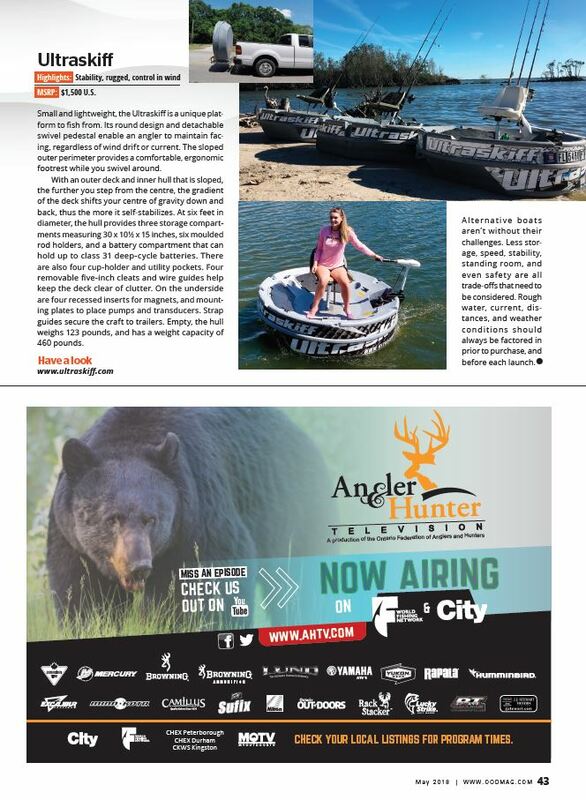 Tractor Supply Co.
5/14/18 The Ultraskiff 360 was featured in what is ranked as the best read print and digital outdoor magazine in Canada, Ontario Out of Doors. The publication is in its 50th year as a national TV show. They featured us in their May 2018 subscription in an article titled "9 sures for shore fishing". We would like to thank them for the product review and the write up, we look forward to our product being featured on their television program one day soon. 3/28/18 The Ultraskiff 360 Headlines "Small Boats = Big Business" in the March 2018 Edition of Fishing Tackle Retailer Magazine! Special Thanks the Fishing Tackle Retailer Magazine for featuring the Ultraskiff 360 in the March 2018 edition of their publication. Being featured as the headliner and leader among the the best of the best small watercraft is truly an honor! 1/16/2018 The Progressive Insurance Atlanta Boat Show! It is time once again for us to display at the Atlanta boat show at the Georgia World Congress Center on January 19th-21th 2018. This is our 3rd year in a row at the show and it was certainly the most love we have received so far. I cannot thank our Atlanta Dealer "Leisure Lifestyle Products" enough for for their help and assistance in making this a fantastic show for us! 10/16/2017 The Progressive Insurance Tampa Bay Boat Show! It is time once again for us to display at the Tampa Bay boat show at the Tampa Convention Center on October 12th-14th 2017. The show was originally supposed to be on Sept 7th - 9th but due to Hurricane Irma it was postponed to October 12th. The show was lackluster because of the sudden date change and inabilities of the show to re-market it with the new dates as efficiently as before. Also, the Demo Pond area was not open this year, which was a big disappointment. Still, we had a lot of fun and sol a few boats to some lucky Tampa Bay Locals, Thanks to everyone who came out to the show!!!! ICAST, the world’s largest sportfishing trade show, is the premier showcase for the latest innovations in fishing gear, accessories, and apparel. ICAST is the cornerstone of the sportfishing industry, helping to drive recreational fishing product sales year round. This year we returned to a booth twice the size as last year and had a decked out Ultraskiff 360 on our rotating display stand like no other before. This boat was the 1000th boat we ever made that was molded early in 2017; I had it wrapped, added Snow Camo Marine Mat surface to the doors and installed 3 RAM mount attachments over the cleats. It looked sharp and was a hit at the show. On day one it was the "on the water" event; where you have an outside booth and anyone in the industry is welcome to come and demo your product on the water. For this event, we had one Ultraskiff at the booth that people could roll around and one in the water that people could demo. It was a blast! Here is a couple of Galleries of pictures taken throughout the week. Incredible News as we were voted the #1 new Fishing Product on Cabelas.com! It has been a really exciting year having our product on the #1 Online Outdoor Retailer in the USA. I remember 6 years ago when this idea was just a ball of clay and a sketch saying to myself: "One day Cabelas is going to sell this product". It is certainly a gratifying thing to see us get off to such a strong start with them. Thank you to all of our recent buyers this year, especially to all who took the time to leave us a review and to all of our independent dealers as well. Everyone deserves a sincere thank you from us! The Ultraskiff is in Canada! Aye? On the international Front we have finally shored up Canadian Distribution through our friends at Adventure Power Products Inc. They are now distributing Ultraskiffs Direct to the consumer and to a network of Brick and Mortor Dealers. Conact Derek Roth, the President Adventure Power Products and he and his wonderful staff can help ship you an Ultraskiff or find you the closest dealer. to see an Ultraskiff in person. We will be there with our dealer Leisure Lifestyle Products LLC who has an assortment of awesome unique watercrafts. See you there!!!! ​Who is ready for a chance to win an Ultraskiff 360 and support one of the best charitable non profits in our communities? PAWS of Steinhatchee Inc. helps people defray the costs of getting your pet spayed or neutered while providing access to affordable Veterinary care. Give Nancy Maxey Conrad (See the Pic on the Right) a call and get your raffle tickets today for chance to win an Ultraskiff at the Fiddler Crab Festival on February 18th at 5:30 P.M. Thanks!! The Ultraskiff was once again a huge hit at the Florida Sportsman Expo. Got to catch up with some industry friends. Also had a lot of people come out and demo the Ultraskiff and got some awesome footage. Ultraskiff just attended it;s second consecutive Tampa Boat Show. This year the show was a HUGE success for us, we had the best booth location in the entire show. Right in the center of the show in a corner booth. It was probably our best show yet because we invested alot in upgrading our signs, banners, TV displays and of course had a great mix of videos playing. The traffic was great, we also had one our round boats in the Demo Pond and people were loving it! Very much looking forward to next year!! Its Time for ICAST 2016! The biggest trade show of the year in Orlando Florida! We Finally Made it to our first ICAST Show and it was amazing! It started with the ICAST on the water booth where we had the Ultra skiff lined up with all the other small watercraft and kayaks for buyers and media representatives to try out, our skiff got a lot of attention and rides that day, thanks to everyone for trying it out. We had our upgraded booth appearance tricked out with new banners, signs, TV's and a rotating skiff platform. It was by far the most exciting thing we have done so far. It was great meeting everyone in the industry and making 100's of incredible contacts. Thanks to everyone who stopped by our booth! The huge Bull Shark caught in the Ultraskiff was such an exciting and revealing test we had to capture the monster of the deep, the Goliath Grouper. We teamed up with the Chew on This Saltwater Fishing show once again to film "The Greatest Fishing Challenge of All Time". It is nice that I can now put this goal to rest for the time being. The Ultraskiff performed phenomenally againstBonito,2 massive Bull SHarks and 2 Monster Goliath Grouper. Thanks to Capt Ben Chancey and Capt Jon Black for making history with us once again! Well it looks like someone finally caught a giant shark in an Ultraskiff 360. We filmed with the legendary Captain Ben Chancey of the Chew on This Saltwater Fishing Show. Watch this video to see all the action from our Go Pros. Ben is an experienced expert at this fish and he had the shark nose up and timid as a lamb within 40 minutes. It was an amazing experience and the video is one of the best samples so far of the stability and fishability of the Ultraskiff. April was an exciting month for us. 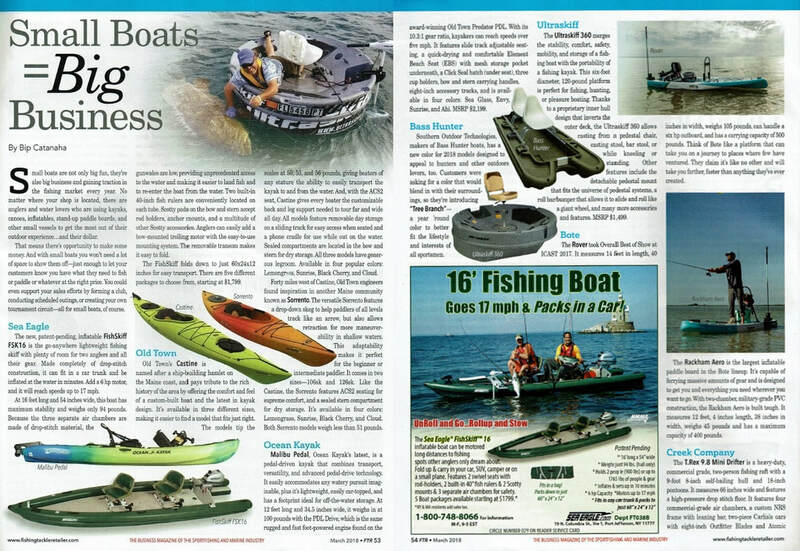 We had a product review and story written about the Ultra skiff by writer Paul Presson. As part of the Review we made 2 videos from the product trials. An inshore fishing trip wit Paul Presson and our 2016 boat wake field test video. Paul suffers from a serious back injury and other ailments from his service in Desert Storm which hinders his ability to kayak fish, he lived locally so I figured this was a great opportunity to show the comfort and versatility of the Ultraskiff 360. 2016 has been incredible for us so far so we are running a special promotional Give-away until April 14th! The winner was chosen on April 15th and we emailed them. Let's see if they respond. 2016 will be the year for the Ultra skiff. We expect to really make our presence known with exciting new accessories and videos due for release January 2016. You are really going to be impressed when you see what we have been up to. We have some exciting trade shows we are attending in 2016. Here is our January/February Appearances. Mark your Calendar and come see me and the Ultraskiff 360 in person. On behalf of all of us here at Ultraskiff Inc. We would like to wish you and your family a Happy Holidays. We are almost finished up with our first Boat Show, the Tampa Bay Boat NMMA Progressive Insurance Boat Show. So far it has been a blast and a good experience for us going into next season. We an on the water Demo booth as well and it was fun to see people get in and use our round watercraft. Looking forward to more shows in the future. Well it looks like we have another Viral video on our hands! We sold out of inventory fast after this but are ramping up production to meet the demand. We are getting ready to make the switch to selling wholesale to dealers and are really excited about it. Well we just had our first Expo and it was a huge success. A lot of people saw our videos over the past year and where happy to finally see the Ultra skiff in person and meet Jeff and our team. What a relief it is to represent such a fine product after all the manufacturing hurdles we had over the past year. Couldn't of been happier with the show and we made a lot of great industry contacts and sales. want to reserve a boat before the show! Well we just had our first month as an operating business. We sold about 40 boats this month so far. Not too shabby since I have YET to spend a single dollar on advertising since day one. But obviously now that I finally have a manufacturer I am confidant in and excellent quality control I can now start promoting and getting the word out. So far our customers all love their boats and I have been posting their pics they send me on Facebook and on the customer pictures page in our gallery. It's exciting and really nice to actually have money coming into my business account instead of out for the first time in 5 years! Ready, Set, Go! This is the start and first Email of our mailing list! We are finally ready to start selling boats! It has been a while since I have updated everyone. I know that people started emailing me last June and I apologize for not keeping everyone up to date on the Ultraskiff but I really have not had any great news to announce until now. We are now basically picking up exactly where we left off. The creative process and complexity of successfully manufacturing this unique design has been the biggest challenge so far. But we chalked up the first 20 prototype samples we sold in 2014 as Market Testing. Happy to announce that everyone loves their Ultraskiff! These problems are common with new products and you have to have the determination and resolve to work through them towards the goal. We ended up with a 33% scrap rate last year and just could not get consistent plastic thicknesses during production runs. After our third run and exhausting all available options we decided to shut things down last fall and re-work the mold and tooling in the Off-Season. We had to bring in outside manufacturing experts and move our molds from FL to GA and then to TX. Our manufacturing base is now in Gainesville TX, about an hour north of Dallas. The boats now mold perfect just how we always hoped they would, so excited!. There is a lot of new information on the website. The F.A.Q. page has been a project of mine ever since I was flooded with questions about the boat last year. I think I have covered all the bases. One of my main focuses in writing the FAQ is to give you a really honest portrayal of the boat. I read every email and I think I have all the information on the page now to help people make a good educated decision whether or not this boat is right for them. I made a new main instructional video and added several new demonstration and customization videos. Now that I am going to start promoting and marketing again, I will begin to post new fishing videos from my ever growing collection of footage. I know a lot of people want to actually see one in person first or try one on the water first before buying, which is very understandable. But we don't have dealers yet or samples out there for trial. So I would say wait until we build our dealer network in the off-season and keep track of our progress as we grow. Its been a long winter and spring as we moved operations and made mold alterations. We were successful in fixing all the problems and are finally ready for a re-launch! 10/14/14 After selling 25 prototypes it has become evident that we have an unsustainable scrap rate and need to find a new manufacture and manufacturing process. 9/24/14 The Ultra skiff 360 will be in it;s very first saltawater fishing tournament this saturday 9/27/14. The weigh-in is at 3 p.m. at The Getaway bar at 13090 Gandy Blvd N, St Petersburg, FL 33702. We will be doing demos as well after the weigh in! 9/21/14 Wew! The first 13 Ultraskiff Prototypes have been sold. There are now 4 in TX, 3 in LA, 2 in TN and 4 in FL. Thanks to all the road warrior who drove all the way to FL to pick up the first boats. I know alot of you are waiting and I am working hard to ramp up production. Waiting to get my next 13 any day now. Check out our new Customer Pics and Testimonials page to see how everyone is enjoying their boats. We also just shipped our first boat direct from the factory. Packaging and shipping has been a challenge but the finish line is near! 9/1/2014 Good morning! I have not been inshore fishing on the skiff since May, I decided to take the summer off so I could focus on getting these boats on the market. I have been planning to start fishing again Sept 1st. So yesterday I decided to skip all the labor day/opening of snook season crowds and do a little relaxing Bass Fishing at Walsingham Reservior in Largo FL. I couldn't of been more impressed, hats off to Pinellas county for doing a great job managing the health of this lake and park. There were bait schools, minimal vegetation and excellent water quality. I was catching 2 to 4 lb bass consistently throughout the heat of the afternoon. The Ultraskiff was a blast throwing crank baits off the casting stool, it took me back to the first summer fishing off this concept in NJ tearing up small lakes and ponds: An application the Ultraskiff 360 really excels at. As the temperatures start to drop I'll be out their fishing more frequently. Anyway, hope everyone had a great labor day and a fun summer! 7/11/2014 Wew what a crazy month it has been. The new main introductory video went viral and is currently at 275,000 views! Orders and inquiries for boats came pouring in and the phone rang for about two weeks straight. To say I was not expecting that kind of reaction would be an understatement. At the same time I'm trying to service everyone who is contacting me and explain why I do not have enough inventory. Things look like they are going to get rolling very soon, I can't wait to kick it into high gear! I recently had a professional fisherman (Glen Pla) demo the boat for the first time on The Average Angler television program and website. This program is featured on Baynews9 and Brighthouse Networks Channel 47. There website is awesome and you can always access their programming, informative segments and fishing trips by visiting http://www.baynews9.com/sports/fishing.html. I though it was an important part of market testing this product to have someone accredited use the boat. I couldn't be more thrilled at how it went. Make sure you tune in to Brighthouse sports networks channel 47 HD 1147 exclusively on brighthouse networks at 8pm Sunday July 20th to see the episode air live! 6/7/2014 Come and test drive an Ultraskiff and see for yourself! We are offering free demonstrations and demos of the Ultraskiff 360 at a Marina/Restaurant in Tarpon Springs Florida. Simply message us through our contact form indicating you are interested in seeing and using the boat for yourself and we will email or call you back and schedule the demo. Boats are already being reserved for those you have left a deposit, so hurry up and get on board to get an Ultraskiff 360 at a great price direct from the manufacturer. 6/7/2014 Here we are, its time to finally have a product launch! After spending over a year working the kinks out of our molding process and tweaking some boat features the Ultraskiff 360 is finally launching and inventory should be readily available in before the start of July 2014. We have completed a new Demo and instruction video and have a collection of high quality Go Pro fishing videos. After releasing these videos the response has been phenomenal! People are really excited about this new design of watercraft! We are getting calls and emails every day from people wanting to purchase boats, we are now offering free demonstrations of the boat to anyone willing to come to a location here in Tampa Bay Florida. We had a long delay due to some manufacturing issues but we are back on track for production going into 2014. Reserve your Ultraskiff 360 and lock in discounted prices direct from us before they hit stores! Thanks to everyone who is waiting for boats for your patience! Here we go!! After years of work the Ultra skiff 360 is finally released! Hope you all enjoy! Please give us feedback and help us evolve!